For the Solemnity of Mary, The Holy Mother of God, January 1, 2013. For Carla, because she showed us how to follow the Blessed Virgin Mother’s example so well. Lord have mercy. Christ hear us. Holy Mother of God, pray for us women. From the moment you were conceived you had sanctifying grace in your soul, and you were born without Original Sin. Then you grew in virtue your whole life. Holy Virgin of Virgins, Mother most pure, Queen conceived without original sin, pray for us to accept the gift of sanctifying grace in our souls so that we, too, may follow your example, even as we know that we will often fail. Mother most chaste, Mother inviolate, Mother undefiled, Refuge of sinners, Queen of Confessors, pray for us to have determination even if the sins of our past still cause us pain and regret. You were chosen to be the Mother of God, whatever grace is available to us, you received fully. You possess a greater degree of sanctity than any angel or human, you are the highest creature. Even so, you do not know all the things that your Son knows, and you are subordinated to Him in the order of grace. Even when you did not know everything, you never lost faith, but only increased in it. Mother of divine grace, Virgin most faithful, Queen of Virgins, Mother of Christ, pray for us to recognize that we do not need to know everything either, so that we may focus on the things God calls us to know. Your obedience, humility, and total devotion to the Son of God make you a supreme exemplar of the Christian life. Tower of David, Tower of ivory, House of gold, Ark of the covenant, pray for us to turn our eyes to you as our model of virtue and see what truly makes us rich. You received the Word of God in your heart and in your body, and you gave Life to the world. Courageously, you accepted this predestination when the angel Gabriel greeted you and counseled you not to be afraid. Thus you conceived, so that just as the choice of a woman contributed to death, so also the choice of a woman contributed to life. Mother of our Savior, pray for us that we may follow your example of humility and obedience in bringing forth new life if blessed to do so. When we discover we are with child, Mother of our Creator, Spiritual vessel, Vessel of honor, pray for us to navigate the anticipatory months with patience and grace as our bodies grow heavy and our mind’s anxious to fulfill our new role with competence. When you visited your relative, Elizabeth, who was also pregnant with a son, John, her child leapt for joy in her womb as he was cleansed from sin and filled with divine grace in the presence of your Son, Jesus. In caring for your relative and friend, you brought Christ to her unborn child. 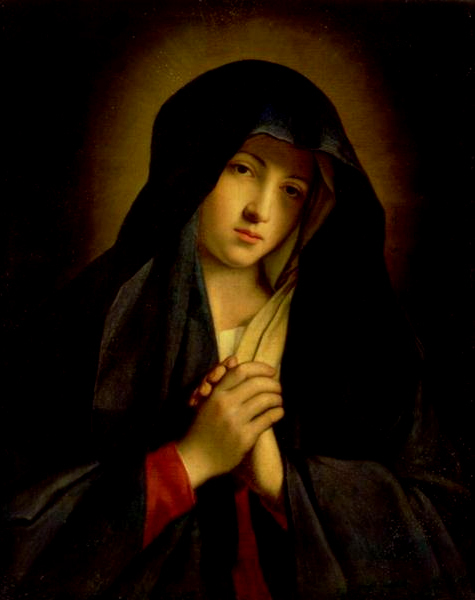 Mother most amiable, Mother most admirable, pray for us, that we may show others the love of Christ. When we say hurtful things because we fear rejection or want to control what we cannot control, pray for us Singular vessel of devotion, that we approach our relationships with honesty, apologize in sincerity, admit our faults, and vow to mend our ways. You presented your Son to the shepherds and the wise men, accepting their gifts fit for kings, though you were poor and your baby was wrapped in swaddling clothes. Pray for us that we may receive gifts with gratitude and accept difficult situations with honor. When we hold our babies in our arms, unsure if we can do the work of mothers, pray for us Mother of Our Creator, that we may receive the grace we need even when we cannot remember to ask for it. When an angel warned Joseph to flee with you into Egypt because Herod wanted to destroy your baby, you were not consumed with anger, but obeyed, and then grieved for the mothers who would not be comforted as they bewailed the loss of their children. When we are troubled by current events, and grow anxious about our nations, pray for us Mother of good Counsel, Mirror of Justice, that we may contribute good to our society in whatever way we are able, remembering our first society, our families. Queen of families, help us to be the loyal and honorable wives to our beloved husbands that we desperately want to be. When you presented your Son in the temple, Simeon foretold that He would be a sign of contradiction, a sword that would pierce your heart so that out of many hearts thoughts may be revealed. You never doubted or shrank from your duties. Pray for us, that we may achieve fortitude during anxious or confusing times. When your child was lost, you were pained with concern, yet you did not complain, but found Him in the temple where He was about His father’s business. Virgin most prudent, pray for us, that we may hold our tongue and spare others the misery of our complaints, even if our children abandon us, even if they do things we do not understand. When moved with pity at the marriage feast of Cana, you interceded for a miracle and asked your Son to turn the water into wine. Mother of good Counsel, Seat of wisdom, pray for us to show compassion and generosity, and to be attentive to the needs of others. As Christ preached of a blessed kingdom beyond the bonds of flesh and blood, you advanced in your pilgrimage of faith, receiving His words and preserving your union with Him all the way to the cross. Queen of Prophets, pray for us, that we may also persevere in our daily pilgrimages. When we mourn the loss of a child, and feel isolated because we think no one understands our sorrow, Virgin most merciful, pray for us to be comforted by your strength, the strength that held you beneath the cross that held your bleeding Son, as you stayed with Him until death. If we hold a child dead in our arms because someone else takes that gift and that life from us, hold us up Queen of Martyrs, Queen of peace, that we may stare evil in the face too, forgive a sinner, and pray for mercy, even as we want to seek revenge, and then whither and die in despair. Remind us in our darkest moments that we all need a Savior, even you. After you consented to suffer with your Son and united your maternal heart with His at the cross, He gave you over in His death to continue on as a mother to His disciple. Virgin most venerable, Queen of Apostles, pray for us that through your Son we may unite our maternal hearts with our brothers and sisters in Christ, encouraging them in charity, even when we feel we have nothing left to give. When you found the empty grave and rejoiced that your Savior was risen from the dead, on the day of Pentecost, you implored the Holy Spirit to pour forth on the human race. Virgin most renowned, Virgin most powerful, Help of Christians, Queen of Patriarchs, pray for us, that we may implore the Holy Spirit too, and remember those people who have no one to pray for them. And if we become ill, even so ill that we will never hold our children’s babies as we once held our children, or if we never have children, or if we die very young, pray for us Health of the sick, Comforter of the afflicted, Cause of our joy, Morning star, that we may be sustained in faith with the hope that the family of humanity will unite in eternity before the face of God. At the end of your life on earth, preserved from all sin, you were taken up body and soul into heaven, exalted as Queen of the Universe so that you could be close to your Son, the conqueror of sin and death. Queen assumed into heaven, Mystical rose, Gate of heaven, Queen of Angels, Queen of all Saints, pray for us, that we never stop hoping for salvation of souls. And if we live a long life full of happy memories, and die peacefully in our bed surrounded by people who love us, or if we die alone and abandoned with nothing left in this world, Queen of the most holy Rosary, pray for us, O holy Mother of God, that we may be made worthy of the promises of Christ. Stacy Trasancos - Thank you Richard and Gloria.